The small village of Buscalan, tucked within the great mountains of the Cordilleras, is not the usual go-to destination in the northern Philippines. 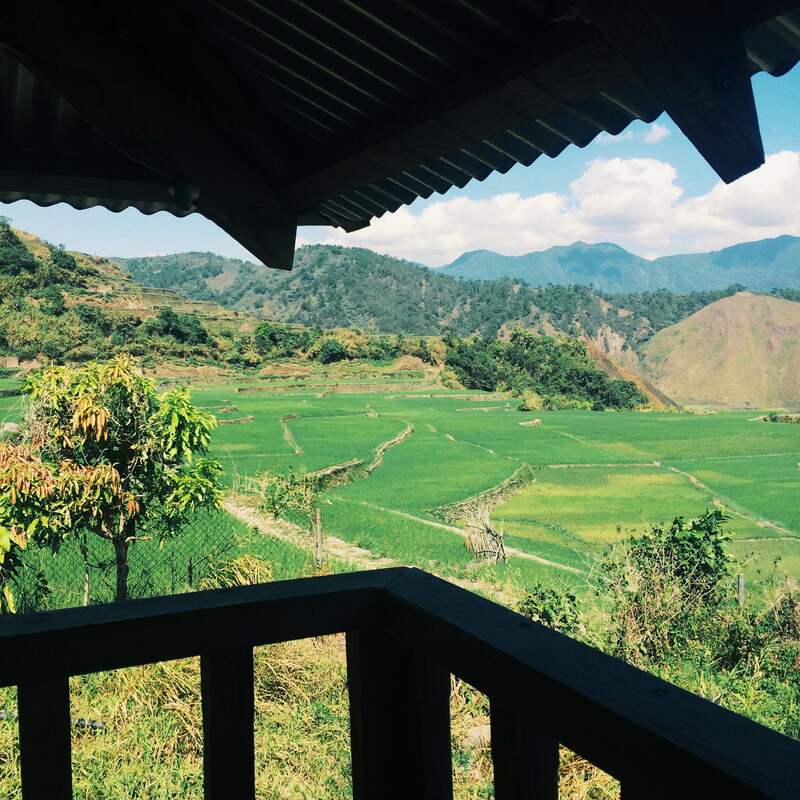 Surrounded by majestic mountain ranges and lush green rice terraces, you will definitely get lost in time in this small isolated village. 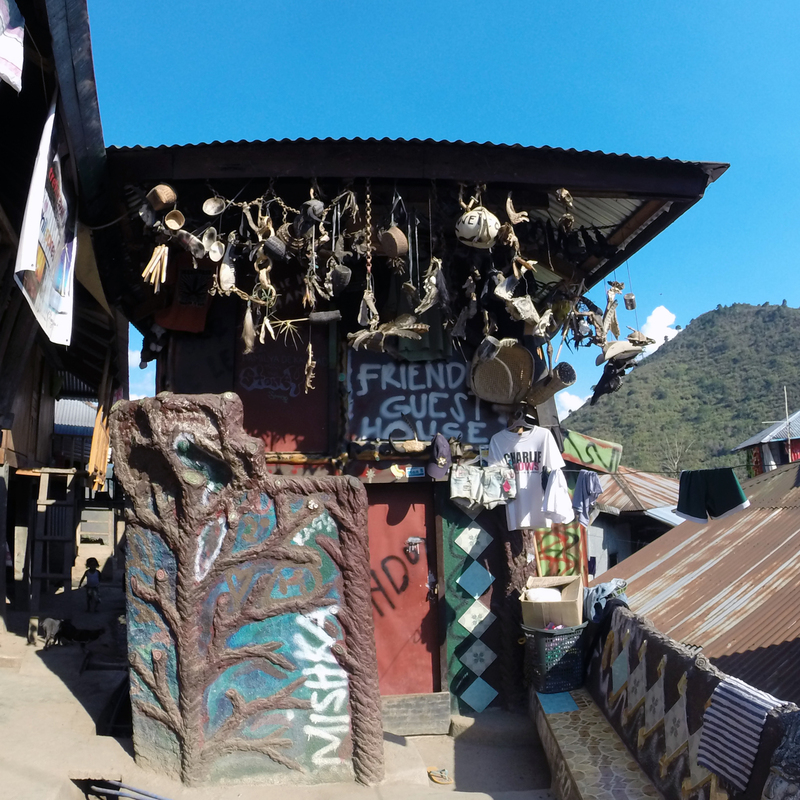 It is also the home of the Butbut tribe known for their headhunting tradition a long time ago and more importantly a home to the last Kalinga tattoo artist Whang-Od (pronounced as Fang-od) and her successor Grace. Take a Tabuk City bound bus from Victory Liner Manila. Tabuk bound buses are available from Kamias station. Travel time is around 10-12 hours. Go down in front of St. William’s Cathedral in Tabuk. From the jump-off (the locals call it turning point) you will need to hike for around 30 minutes to an hour to reach the village proper. We were told that shorter Manila-Baguio-Bontoc-Buscalan and Manila-Banaue-Buscalan routes are also possible (Although the difference in travel time is not that significant). 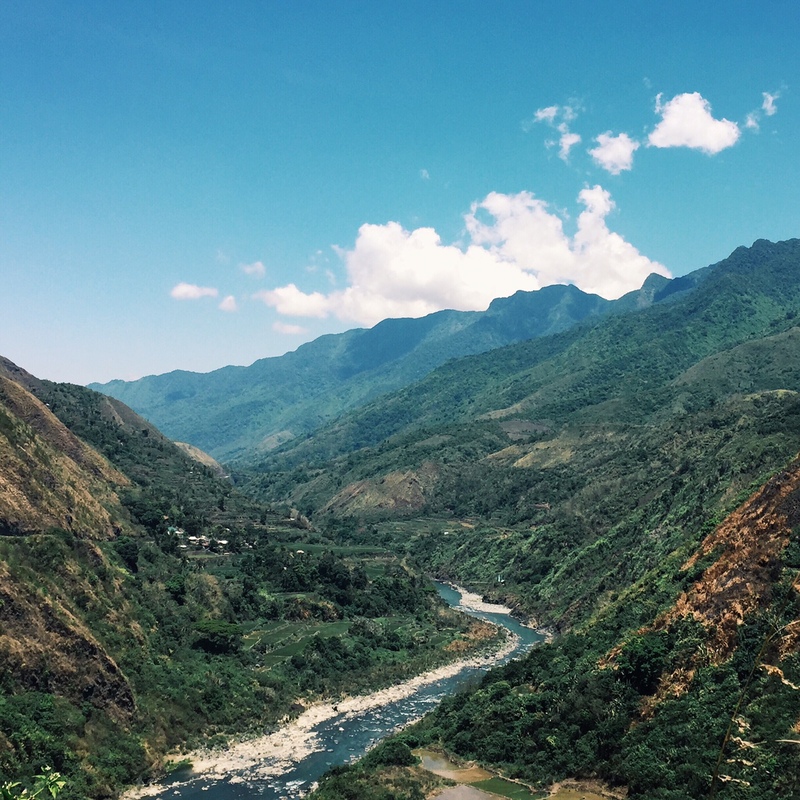 We decided to take the Manila-Tabuk-Buscalan route instead to avoid all the transfer hassles. According to our guide, a number of home-stays are available in the village. They charge a fixed rate of P250/person/night. We recommend staying in Rastafara, located on the top of town, mainly because of its balcony overlooking the rice terraces. 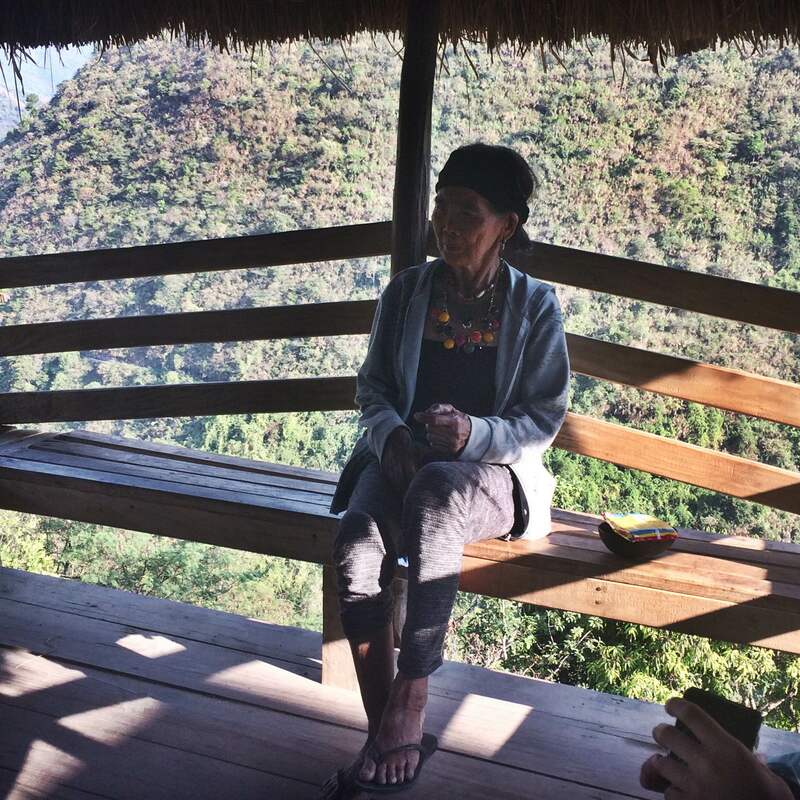 Majority of the home stays are located at the lower part of town near where Apo Whang-od and Grace usually tattoos. Our bus departed exactly as scheduled at 7 in the evening. Since it was the Holy Week, we decided line up for tickets more than a week before. Luckily, we got the last remaining seats for that schedule. 1330 Arrival at turning point (Jump-off). Start hike. 1430 Arrival at Buscalan. Rest. 1600 Visit Whang-Od and Grace. 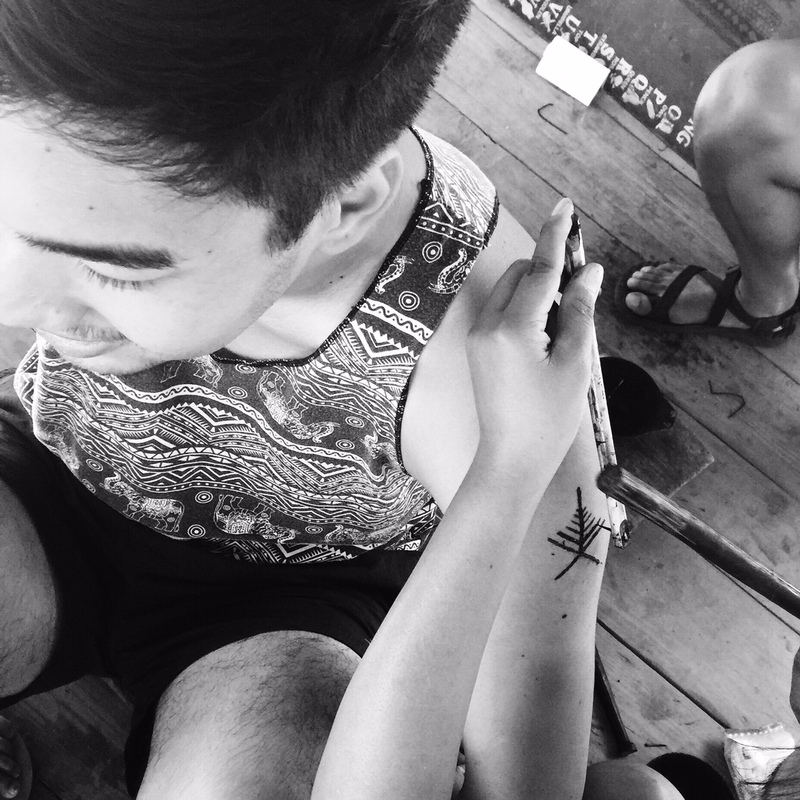 Watch other tourists get their tattoo. Walk around. We originally planned to take the jeep bound for Bontoc. But locals, approached us and said that there’s a van available going directly to the jump-off. So we took that instead. The trip took more than 4 hours because the driver took a lot stops. Good thing one of the stops was the Sleeping Beauty view point where you can see a mountain shaped exactly as its name suggests, a sleeping beauty. We also had a lunch stop at Tinglayan before heading to the jump-off. Can you spot the Sleeping Beauty? Be extra careful during the hike since you will be passing by cliffs. Falling is not an option. You may also want to swim at the waterfalls midway through the hike before the final assault to the village proper. The hike wasn’t that difficult but it can be really tiring at the latter part. After settling down, we decided to get our tattoos as originally planned. Unfortunately, Whang-od was too tired to accommodate more tourists that afternoon so we decided to get ours the following day. After getting breakfast, we went directly to Whang-od and Grace. As expected as it was a long weekend, a lot of tourists were already “lined up”. There’s no clear queuing system in place. It’s usually on a first come first serve basis or whatever’s agreed between the group. According to Oliver, our guide, sometimes it’s palakasan so make sure to be with your guide when you plan to get your tattoos done. We just asked him that we’re going to get our tattoos and he did all the talking for us. After 4 hours of waiting, and some pasingit, it was finally time. Don’t worry the 4 hours did not feel long, it was entertaining watching other tourists get their tattoos done. Ginawang or “hawk” tattoo by Grace. Bubut tribe’s symbol for the scorpion. Charged us only P400 each. After getting the tattoo, we took our lunch at one of the sari-sari stores. We then rested and bummed all afternoon at the balcony of our home-stay. Our guide checked up on us and asked us if we wanted to walk around the rice terraces, so we did. This was a very lazy day for us since we did not want our tattoos to be exposed to the sun. We woke up early in the morning since the vans, buses and jeepneys depart from the turning point early. Our van departed for Tabuk at around 8am. Bontoc jeepneys were also there at the jump-off. (Bontoc-Baguio-Manila route is possible) The drive back to Tabuk was faster. It only took us around 3 hours to get there. We were dropped off directly at the Victory Liner ticket booth near St. William’s Cathedral. We departed late, since we had problems getting tickets back to Manila, again as expected as it was the holy week. Luckily, a friend of ours who’s from there helped us get our tickets from another Victory Liner bus station in Dagupan (A 20-minute jeepney ride away from the main road. Dagupan is another town in Tabuk, don’t mistake it for Dagupan, Pangasinan). We recommend that you book your bus tickets early, if possible, to avoid the hassle. Transportation: P600 – P700 one way ticket to Tabuk. P200 Van to Buscalan. Bring candies for the kids and matches or medicines for the elders. They usually ask for this when you go around the village. Don’t worry, this is completely optional but we recommend it. There are no restaurants in Buscalan. We just asked our guide to cook food for us since there’s a kitchen in Rastafara. There are also sari-sari stores in town. We originally planned to go to Buscalan on our own without a guide. But when we reached Bugnay two guides assigned by the barangay joined us. According to them, guides are now required with a fixed rate of P1000/day good for 5 people. We got skeptical at first but based from our experience, it’s worth it! Our guide toured us around and even cooked food for us. In the mornings, or when there’s nothing else to do, they will give you Kalinga brewed coffee, for free! Our guide was Oliver, you may reach him through Jonathan Baydon (09207106397) or Christopher Sagmayao (09207105885). According to our guide, Whang-Od is not really the “last Kalinga tattoo artist” who practices the art of Batok. There are also other traditional tattoo artists found in Kalinga, some are even residing in Tabuk City. Grace has been to Dutdutan twice. Dutdutan is one of the Philippines’ biggest tattoo expo held in Manila. Whang-od and Grace were featured a few years back in a Discovery Channel documentary Tattoo Hunter by tattoo anthropologist Lars Krutak. Hi everyone, I wanna ask if is it possible to rent a van from manila up to destination to meet whang od?I’m planning to go there this year.Any good suggestion please! Thanks. Hi venus , I am going about July 25th . I am preparing for a documentary firm in November. I would like to get a baybayin tattoo from Whang Od. I know the words in english and tagalog, but not in baybayin. Is there someone in the village (Busculan, Tinglayan) who can translate them to baybayin? Hi Jan, we recommend not getting a personalized tattoo. They have a good selection you can choose from (from their tribal symbols). 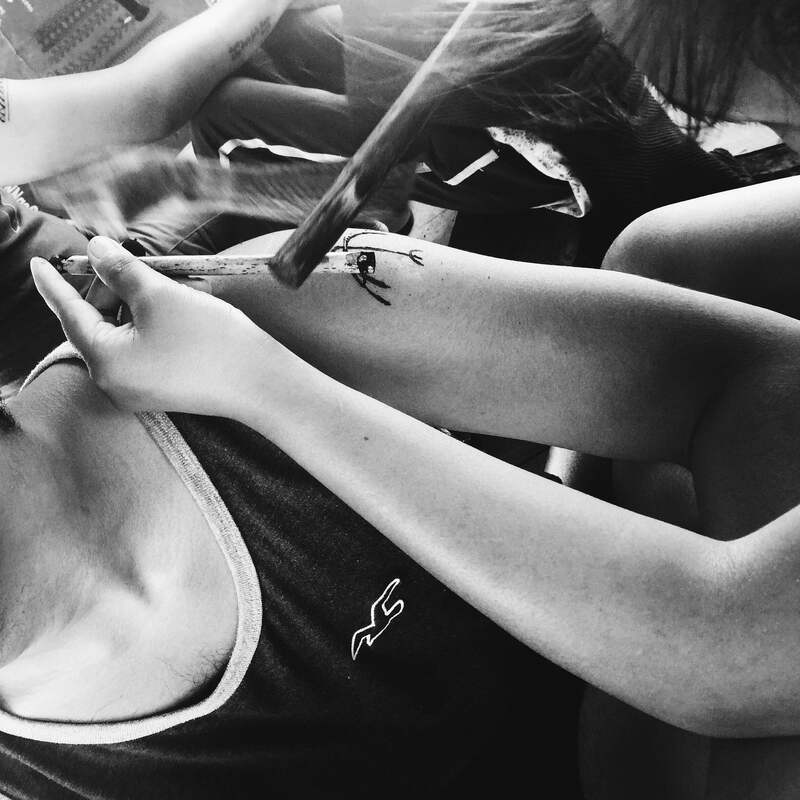 We experienced/saw a girl who asked for a baybayin tattoo and it did not turn out good because they’re really not used to it. Hi, to everyone to those who are interested to visit and travel to Tinglayan kalinga, to experience village hopping, visit wang od tattoo of Buscalan, and viewing Tha sleeping beauty of Tinglayan, visit Dananao and Tulgao rice Terreces and palang ah falls and hot spring. Contact or pm me cp # 09157310631/09995062479 for confirmation and details. Contact person Gene Dee tour guide and operator. Hi bert! i’m travelling solo this november 12 to buscalan village. naghahanap ako ng masasabayan para ma-lessen yung expenses. i have a contact with a tour guide already. Hi Catherine, can I join you? budget?